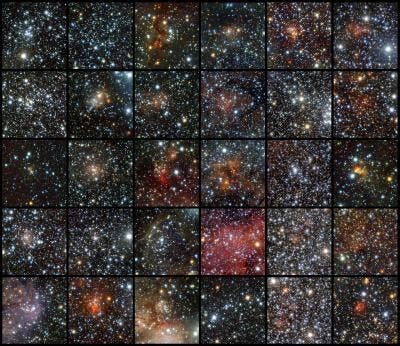 This past summer, Using data from the VISTA infrared survey telescope at ESO’s Paranal Observatory, an international team of astronomers has discovered 96 new open clusters hidden by the dust in the Milky Way. Thirty of these clusters are shown in this mosaic. These tiny and faint objects were invisible to previous surveys, but they could not escape the sensitive infrared detectors of the world’s largest survey telescope, which can peer through the dust. This is the first time so many faint and small clusters have been found at once. The images are made using infrared light in the following bands: J (shown in blue), H (shown in green), and Ks (shown in red). "This discovery highlights the potential of VISTA and the VVV survey for finding star clusters, especially those hiding in dusty star-forming regions in the Milky Way's disc. VVV goes much deeper than other surveys," says Jura Borissova, lead author of the study. The majority of stars with more than half of the mass of our Sun form in groups, called open clusters. These clusters are the building blocks of galaxies and vital for the formation and evolution of galaxies such as our own. However, stellar clusters form in very dusty regions that diffuse and absorb most of the visible light that the young stars emit, making them invisible to most sky surveys, but not to the 4.1-m infrared VISTA telescope. "In order to trace the youngest star cluster formation we concentrated our search towards known star-forming areas. In regions that looked empty in previous visible-light surveys, the sensitive VISTA infrared detectors uncovered many new objects," adds Dante Minniti, lead scientist of the VVV survey. By using carefully tuned computer software, the team was able to remove the foreground stars appearing in front of each cluster in order to count the genuine cluster members. Afterwards, they made visual inspections of the images to measure the cluster sizes, and for the more populous clusters they made other measurements such as distance, age, and the amount of reddening of their starlight caused by interstellar dust between them and us. "We found that most of the clusters are very small and only have about 10-20 stars. Compared to typical open clusters, these are very faint and compact objects — the dust in front of these clusters makes them appear 10 000 to 100 million times fainter in visible light. It's no wonder they were hidden," explains Radostin Kurtev, a member of the team. Since antiquity only 2500 open clusters have been found in the Milky Way, but astronomers estimate there might be as many as 30 000 still hiding behind the dust and gas. While bright and large open clusters are easily spotted, this is the first time that so many faint and small clusters have been found at once. These new 96 open clusters could be only the tip of the iceberg. "We've just started to use more sophisticated automatic software to search for less concentrated and older clusters. I am confident that many more are coming soon," adds Borissova.